SWR BARROSELAS METALFEST is one of the oldest extreme music festivals in Europe, running since 1998. Located since the first edition in the quiet village of Barroselas, Northwest Portugal, the festival has two indoor stages, whose entrance is allowed only to ticket holders, and one outside stage with free access. Through the years the festival has seen some of heavy metal's biggest names rise on the stage, bands such as Venom, Immortal, Kreator, Possessed, Sodom, Napalm Death, Bolt Thrower, Suffocation, Dying Fetus, Primordial, Watain, Hypocrisy, Candlemass, Ratos de Porão, Immolation, Triptykon and many more. You can check the HISTORY section for more details and posters. TRAIN: If coming from the South, take the CP train to Porto (Campanhã) and then take the Inter-Regional/Regional train heading to Barroselas. If coming from the North, you must take the International train coming from Vigo (Spain) heading to Porto and get out in Barroselas. If coming from the Interior, you will have to change trains in Nine, catching then the Inter-Regional/Regional train heading to Barroselas. Check the schedules at www.cp.pt and get 30% discount here. CAR: If coming from the South, take the A1 highway, direction Lisboa-Porto. After the last toll go straight to IC1/Ponte da Arrábida and then turn right following the direction A28/Viana do Castelo. Turn right to Neiva/Braga/Barcelos and at the roundabout follow to EN13/Zona Industrial and 5km ahead turn right to Barroselas (EN308). If coming from the North, from Spain, through the International Bridge of Valença do Minho, go straight to IP1/A3 direction Braga/Porto and get out at the Corvos/Anais toll. Follow through EN201 until Corvos, and from there take the EN308 to Barroselas. If coming from the Interior, Braga or Guimarães, follow the directions to A11/Barcelos and get out in Barcelos. Take then the EN103 to Viana do Castelo and turn right about 5km ahead to get into EN305 to Barroselas. PLANE: Porto (65km) and Vigo (90km) are the closest airports. These operate several airlines and are connected to railways stations. 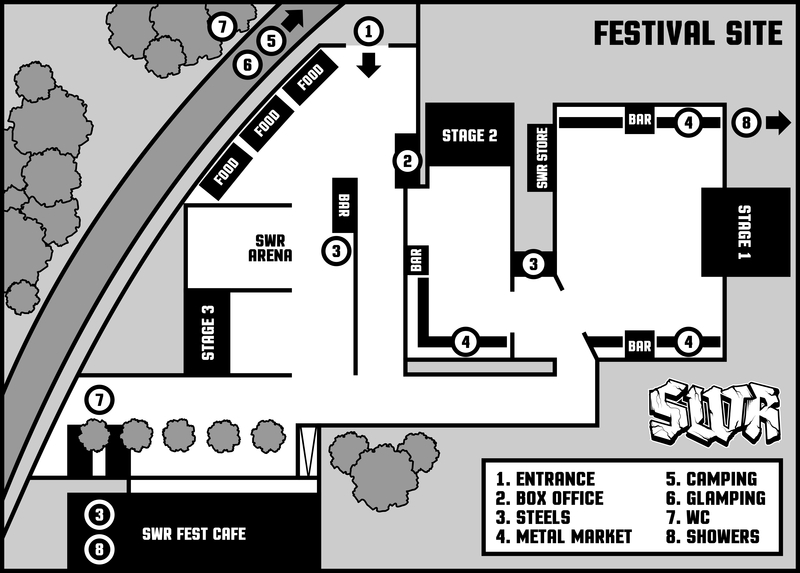 1) ENTRANCE: Wristband or ticket not needed to enter the SWR Arena but pets, non-authorized professional cameras, drinks and dangerous objects are not allowed. 2) BOX OFFICE: Where you can purchase tickets, confirm your reservation or exchange your wristband. 3) STEELS: Where you can acquire beverage tokens. Steel is the official currency for the event. 6) GLAMPING: Glamorous Camping by Free Spirit Campers. 8) SHOWERS: Hot Showers available for free. SWR STORE is the place to buy the official merch of the festival, including t-shirts, hoodies, anoraks and other cool goodies like lighters or patches. SWR FEST CAFE is where the extra activities take place. Open 24 hours a day, you can purchase drinks, coffee, tobacco or snacks anytime you need. SWR's camping is located on a wooded area two minutes from the main venue and opens on 22 April 2019. Free entrance. Sun is no problem (even if it doesn't rain) because of the high tree density that makes shadows an abundant resource so your wake up time depends only on how loud your neighbours are. The campsite has daily cleaned WCs, dish washing facilities, night-time lighting and a supermarket, coffee shops, restaurants and a kiosk nearby. Hot showers are available at the ADB sports complex, near the camping area, open during some hours every day. If showers are not your thing, there's also the infamous Neiva River, a ten minute walk from the venue. Only for the bravest. 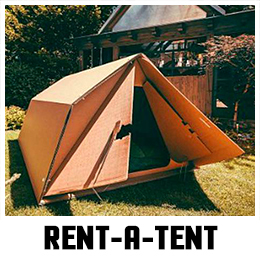 If you have no tent don't worry, our partner FESTICKET has you covered with options for tents and on-sale store of camping utilities. Check them out at www.festicket.com/festivals/swr-barroselas-metalfest/2019/shop/camping/15097. Inside the venue there is a special area for food and drinks with various options that range from fast food to traditional portuguese cuisine or vegetarian food. Outside the venue there is a supermarket nearby and many restaurantes and coffee shops ready to fulfill your needs. To drink you should acquire the official festival cup (you may also bring another edition's cup) and beverage tokens that can be exchanged for beer, soda, water or spirits. You may exchange your old cup for a clean one at the bar.